Justin Timberlake, left, and Chris Stapleton perform at the 49th annual CMA Awards at the Bridgestone Arena on Nov. 4, 2015, in Nashville, Tenn.
Taylor Swift may have left country for pop, but after his top notch night at the CMA Awards, Justin Timberlake could easily trade pop for country. Timberlake had one of the brightest moments at the 2015 Country Music Association Awards with his performance co-starring singer-songwriter Chris Stapleton on Wednesday in Nashville, Tennessee. No one turned more heads at the CMA Awards like Timberlake. As he strummed his guitar onstage alongside Stapleton, everyone in the audience - even the men - was in awe as the pop prince entertained with his signature, killer falsetto. Keith Urban recorded the performance with his phone, Jake Owen smiled like a little boy with a crush and Jessica Biel watched her hubby closely with excitement. Most sang along and others gazed as if Timberlake was an icon making a comeback. The 8-minute performance of the country classic "Tennessee Whiskey'' and "Drink You Away,'' from Timberlake's latest album, was smoky and masterful. "How you feelin' tonight? Can I put a little Memphis up in here?'' Timberlake asked. The crushes Wednesday night didn't end with Timberlake: Little Big Town also felt the love. The foursome won vocal group and single of the year for ``Girl Crush,'' their No. 1 smash that has brought their 17-year career as a group to new heights. Even Luke Bryan is rethinking their opening slot on his tour next year. "I told them backstage, `If you guys keep winning awards, we might have to flip-flop this daggum tour,''' Bryan said. "Girl Crush,'' which has sold close to 2 million tracks, also won song of the year, awarded to songwriters Liz Rose, Lori McKenna and Hillary Lindsey. "We knew when we first heard the song that it was incredibly special. It literally took my breath. I gasped when I realized what this song was actually about,'' Kimberly Schlapman said backstage. Miranda Lambert accepts the award for female vocalist of the year at the 49th annual CMA Awards at the Bridgestone Arena on Nov. 4, 2015, in Nashville, Tenn.
"I needed a bright spot this year,'' Lambert said onstage when she won female vocalist of the year. She also won quote of the night. Lambert and Shelton announced they were divorced in July, and hours before the CMAs aired, Shelton and Gwen Stefani confirmed they were a couple. Hosts Carrie Underwood and Brad Paisley made light of the former country couple in their opening number. "And of course we can't ignore the breakup that rocked our world,'' Underwood said as the camera panned to Miss Piggy and Kermit the Frog. "On a completely unrelated topic, howdy Blake?'' Paisley said. The audience laughed, as did Shelton. 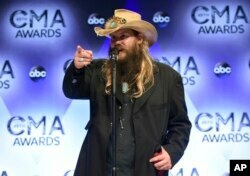 Chris Stapleton, winner of the awards for new artist of the year, album of the year for "Traveller," and male vocalist of the year, at the CMA Awards, Nov. 4, 2015. Chris Stapleton has written songs for so many folks in Nashville that it shouldn't be surprising that most of the CMA members voted for him. Stapleton cleaned house and won all of the awards he was nominated for, including album, male vocalist and new artist of the year. He grew emotional onstage and dedicated his wins to his father, who passed away two years ago. "It's surreal, very unbelievable ...I feel very loved,'' Stapleton said backstage. The songwriter behind hits like Bryan's "Drink a Beer,'' George Strait's "Love's Gonna Make It Alright'' and Kenny Chesney's "Never Wanted Nothing More'' says he's not sure what he plans to do after his CMA success. "I've been in the music business for a while, but I've never done anything like this. It's a little overwhelming, but I'm going to do my best to handle it with some degree of grace,'' he said. Though Lambert and Kacey Musgraves shined during their performances, and Underwood worked as host, performer and nominee, the CMAs could have been called the Country Male Awards. The men overshadowed the women during the performances on the three-hour telecast, which included Bryan, Shelton, Paisley, Jason Aldean, Dierks Bentley, Sam Hunt, Eric Church, Florida Georgia Line, Kenny Chesney, Brooks & Dunn, Zac Brown Band, John Mellencamp, Thomas Rhett, Fall Out Boy and Hank Williams, Jr.
Let's do better, CMAs and country radio.